Is anyone else angry and sad?A couple of things have happened to me over the last few days which have made me angry and sad. Let me tell you about them. On Friday I had a chat with a young man in my form at registration time. He is a 14 year old keen motocrosser and I like to keep up with his achievements. He had been to Perry Barr on Thursday evening “but it was OK Miss, I had my stab vest on”. We talked a bit about Birmingham and then he said “But this isn’t right, Miss, is it?” “What’s not right?” I said. “A church and a mosque next door to one another” he replied. I was a bit baffled by this. “What’s wrong with a place of worship being next door to another place of worship?” “Well, the church was there first” was his view. “It probably was” I said. “So what?” “This is Britain” he said, “It’s not British to have a mosque near a church. They should close the mosque.” This alarmed me. “Hang on a minute,” I said. “How do you decide which place of worship to close?” “Easy” he said. “Close the mosque. We don’t want them here anyway”. This made me angry and sad. It seems we are hearing more and more of this thinly veiled hate speech and racism. Why? Were these unacceptable opinions always there but have been emboldened by Brexit as the country swings further to the right? Is the nation scared of change, or of what they see as “otherness”? I attended a workshop the following day organised by my union (NEU) about welcoming refugees. National Refugee week approaches (18-24 June) and NEU are continuing their wonderful work around making schools and communities inclusive and welcoming for families fleeing war, torture and trauma. While there I listened to Gulwali Passarlay, a young Afghan man who had arrived aged 12 from Jalalabad via Turkey, Greece, Italy and Calais. “I was in a refrigerated truck full of bananas” he told us as he described the journey from Calais. “Luckily the fridge wasn’t on or we would have died. We tried to eat the bananas but we couldn’t, they were too green”. As he was an UAM he was allowed to stay and has recently graduated from Manchester University, and spends a great deal of time telling his story to raise awareness. It was uplifting to spend time with likeminded people swapping stories of what we had already done to open our communities, discussing how to adapt and change ideas and planning how to continue to make displaced frightened people welcome and feel safe and included. But on the journey back to Barton I was back to being angry and sad as yet again the hate speech was back, as far too many people were marching in London shouting for the release of a far right propagandist. And there were lots of them. Enough to make me not just angry and sad but also a little bit frightened. Is this the norm? Are we to accept that this is how things are? As a proud internationalist I don’t want to see the UK, a country with a strong tradition of rescue, welcome and inclusion reduced to an insular, inward looking place of intolerance. It is time for us to stand together, challenge hate speech and racism whenever we find it and make the UK a place of unity and inclusivity once more. They keep telling us to be more active, don’t they? Walk more, they say. Take some exercise. It’s good for you, they say. Change your habits, they say.Well, my habits changed in 2010.I’m sure you remember that wonderful election night of 1997 – I went to bed with “Things Can Only Get Better” ringing in my ears. No one could have been happier than me – a child of the Thatcher years – to see a Labour government being ushered in. I wasn’t a party member then and had done nothing to make it happen, but I was so happy. We saw wonderful changes. As a teacher all of a sudden I could stop hoarding random things in case they came in useful- there was money for textbooks, life at school became easier. We had a lovely new health centre built in my bit of the Lichfield constituency. The Iraq War took the edge off things for sure, but despite my opposition and CND membership I kept the faith and kept voting Labour. And then came the rude awakening of 2010, when we woke up to a coalition government. All of a sudden I was angry. I was angry that money was being diverted away from education and I couldn’t do my job properly. I was angry that stupid decisions were being made about the NHS, one of the best Labour achievements admired worldwide. I became more active in my trade union as we took strike action over pay, workload and pensions. All of a sudden I was on the march, I was manning street stalls, I was leafleting. I became a union rep and rallied the troops. Someone had to try, why shouldn’t it be me? I remember going to a public meeting in Burton about the ongoing privatisation of the NHS in 2013, where I met two fantastic people who I am proud to have as friends and comrades. Cheryl Pidgeon, a trade unionist of long standing and Labour PPC for South Derbyshire gave a passionate, inspirational speech condemning the plans for Virgin Healthcare to take over cancer and end of life care at Burton. Never one to miss an opportunity to slam the Tories I gave an impromptu speech from the floor, and was approached at the end of the meeting by Paul Walker, a local trade unionist who asked me to join the newly re-formed East Staffordshire Trades Council and support their ongoing campaigns. It was time to join the Labour Party and be properly active. All of a sudden Cheryl and I were out and about campaigning. We walked up hill and down dale. We leafleted, we banged on doors. I had never done anything like this. By listening to Cheryl, her agent Jane and campaign manager Olwyn I learned so much – planning a campaign, how to answer sticky questions on the doorstep, how to give a quick, powerful and effective stump speech. I met new comrades, made new friends. East Staffordshire Trades Council went from strength to strength. I was elected Vice Chair in 2015 (very proud indeed to be the first woman vice chair) and we worked so hard together. We walked to Stoke for the NHS (I still have scars from the blisters). We stood up against the fascist Britain First when they decided to march in Burton. We started a new Staffordshire trade union tradition of celebration of Workers Memorial Day. Just recently we pushed a hospital bed from Burton Hospital to the Washlands to draw attention to privatisation of the NHS. There is always something to be getting on with. I can safely say that being an active Labour member has completely changed my life for the better. Going on the march cements friendships and I have made many new friends. Together we have set the world to rights while on the leaflet trail, and there has been much fun and laughter. 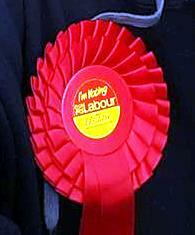 I have campaigned all over the county, in South Derbyshire, in Derby North. Without campaigning I would never have seen a spectacular sunset at the top of Empire Road, or the dawn break over Melbourne Avenue. Without campaigning I would never have had the opportunity to develop my own public speaking skills, or the confidence to stand for election myself. Without campaigning my own political thought would have missed many opportunities to grow and develop. They keep telling us to be more active, don’t they? Walk more, they say. Take some exercise. It’s good for you, they say. Change your habits, they say. Get active. Get campaigning. Together we can change things.